I am excited to announce a new contest going on at the Daviess County Public Library in the months of August and September 2017. 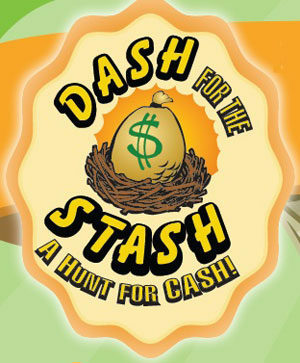 The program is called: DASH for the STASH and it’s been going on now in the state of Kentucky for the past 4 years. This is the first year that our library has decided to be a part of the contest. Does this contest involve running? No, it doesn’t but instead they are wanting the public to “dash” down to their local public library and enter for a chance to win. Starting August 1st through September 30, 2017 stop by the Daviess County Public Library to register for an exciting new contest called DASH for the STASH, which is like a scavenger hunt, except instead of finding objects, participants answer quiz questions via smart phone, mobile device or desktop computer. All you need is to come to the library, read 4 posters on investor education and answer a question related to each one. If you use a smartphone or mobile device you will need a QR code reader app installed on your phone to participate. Participants will also be required to have an email address to enter the contest. To be entered in the contest, each participant must answer the quiz questions correctly for all 4 posters for a chance to receive the statewide prize of a $1,000 IRA contribution. So, is it sounding more appealing now than before? I certainly hope so because that’s a pretty nice chunk of change for a retirement account. And, according to those in the financial industry, there are tons of people on the brink of retirement who have saved very little and that’s not good. For instance, did you know that only 58% of Americans are actively saving for retirement. This means that more than 40% of the population is putting nothing away. Here’s another statistic: 48% of Americans have less than $10,000 saved for retirement. This is nowhere near good enough for a sound financial future. Therefore, if you happen to be one of those people where retirement is now looming on the horizon this would be a great opportunity for you. On the other hand, if you are young and just starting out in the working world, this would also be great to help kick-start your savings habit. Remember, if you don’t enter you definitely won’t win. However, if you do enter, you always have a chance at taking home the prize. There are only a select few libraries in Kentucky that are participating in this contest so there is a very good chance you could win and wouldn’t that be fantastic! Plus the library with the most entries in the contest gets an extra little bonus themselves so there’s even more incentive to come in and register. So, stop by in August and September and DASH your way to a new STASH of cash with a $1,000 IRA contribution! For more information about the contest, please contact the library at 270-684-0211 Ext. 4.